A few things come to mind when assessing Season 3. The first is "Formula." Like no other season, we get more of the "Kirk, Spock and McCoy beam down to a strange planet for some reason" story intro. I'm not saying it is necessarily bad, but it is noticeable (e.g. "The Empath," "The Paradise Syndrome," "Plato's Stepchildren," among others). "Budget." We get more bottle shows and scaled back sets in this season than in any other. Only two episodes feature location shots, and we get a lot of re-uses, both of set pieces as well as of actual shots of film. This leads to some continuity errors, such as Scotty's magic morphing haircut, Chekov and Sulu's amazing disappearing act on the bridge, among many other gaffes. "Network Interference" began to rear its ugly head. NBC, who actually has been known recently for spectacularly dumb decisions (I'm still smarting over "Kings"), consigned Trek to the Friday 10pm "Death Slot," despite promising a much choicer slot to Roddenberry before the season started. This led to Roddenberry's departure. Turnover hit several other positions, including cinematographer, script consultant (the wonderful D.C. Fontana was forced to an untimely departure), and producer Bob Justman, who resigned after 14 episodes of Season 3, citing declining script quality and poor treatment by the network . While I don't have the knowledge to point to problems created by these moves, they certainly couldn't have helped. I think you'll notice, despite a few later highlights, a steady decline in the quality of episodes - the last third of the schedule is backloaded with 2's much more than on the front end. And then we have the "kiss" imbroglio, another instance of interference which thankfully was fought through. OK, all of this being said, after viewing it again for this blog, Season 3 was better than I anticipated, despite a few stinkers. I upgraded my ratings on several episodes after re-watching, and my appreciation for some of the highlights has grown. I'll discuss those later. In general, though, I think what saves a batch of weaker scripts is simply the love that we have at this point for the actors' creations. Some scripts are good, some are bad, some effects are good, some bad, but the actors always connect with the audience. There are only a few times when characterization veers so off course that the actor can not save the script. For the most part, I'm with them all the way. Incidentally, it reminds me of TNG in reverse - Season One suffered from some real stinker scripts, but the actors connected very quickly and probably saved the show. I agree with pretty much everything you've said, Matt. This is the weakest of the three seasons, but not by much. 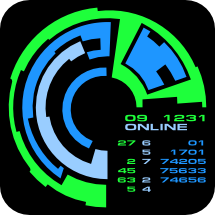 Watching through the episodes, it felt like we gave out a lot of fours that should/could have been fives and threes that should/could have been fours. But it was always only one small choice in writing or acting that seemed to make the difference. I think Matt does an excellent job of stating why that happened. I think Rodenberry's departure had a huge effect not just in terms of decision making, but possibly in morale. The Original Series is definitely the series that is the closest to his original vision, and that makes his absence all the more stark. Even knowing what was happening to the series, the actors themselves never let on. Right up to Turnabout Intruder, everyone gave their all, and it kept afloat some really questionable scripts. I've said this before, but science fiction dialogue is hard. It requires a great deal of skill and dedication to deliver it with the conviction that makes the viewer think you believe it, but not so much conviction that the audience laughs at you. 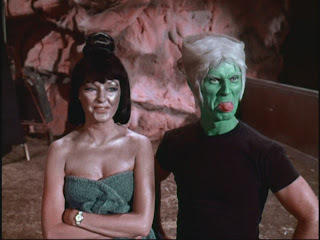 It's clear in every frame of even the worst of TOS that the actors cared about their characters and the show as a whole, and there aren't enough space hippies and bad wigs in the universe that can make that wholly unentertaining to watch. Matthew: "The Enterprise Incident" might be the easy pick for best of the season. It is not mine, but it is a whale of an episode. It really brings the Romulans to life, it has a great espionage storyline, and it features a wonderful and strong female antagonist. "Spectre of the Gun" is weird. But in a good way. The bizarre, half-finished sets and the eerie, fate-dictated story really make for a strange and satisfying TOS romp. "Plato's Stepchildren" is famous for an interracial kiss, but it should be famous for having a good story and some poignant performances. All five main players (with two women!) deliver in spades, and little person actor Michael Dunn really imbues his Alexander with a lot of pathos. I truly felt for the character, and not only because I knew the actor died shortly after the run of TOS. "Requiem for Methuselah" had some characterization problems with Kirk, but was saved and turned into a great by a few highlights. First off, it has a great sci-fi backbone, with an immortal man who has witnessed all of Earth's history. There was very good dialogue and acting, for the most part. In the finale, one of my all-time favorite Trek moments occurred ("Forget..."), one which erased one of the episode's problems and was a nice character moment between Kirk and Spock. "The Cloud Minders" was quite political, but very much an entertaining episode. This may be the closest Trek flirts with a Marxist commentary, but it doesn't go so far as to advocate socialism. "All Our Yesterdays" is my favorite show of the season, hands down. The science fiction concept is dazzlingly strong. It is meaty enough to support novels (and did in fact inspire a novel revisiting the characters). But not only that, we get some killer sets and some wonderful character moments. Yes, we've seen Spock suffer from a lost love before, but this time it's all done perfectly. This was an unfailingly entertaining episode. I agree with the other episodes that Matt has singled out, and I would add "Mark of Gideon" as a great episode that was a haunting take a topical issue, and without comment seemed to endorse what even now can be a touchy subject on television. Matthew: "And The Children Shall Lead" was simply disastrous. It commits what I consider the worst sin against Trek - characters have to act foolishly in order to move the plot forward. Kirk lets the kids have free run of the ship. Security guards not only fail to earn their pay, they should refund whatever the heck currency is in use by Starfleet. That, and the masturbatory hand gestures by the kids, kill this as Trek for me. "The Way To Eden" used to hold my top spot for "stupidest episodes." But having re-watched it, I can say that it actually has the skeleton of a good story within it. Unfortunately, that skeleton is clothed with greasy, yucky, guitar-playing hippie. Although it can be enjoyed for camp, it's hard to enjoy this as Trek. "The Empath" was weird, but in a bad way (unlike "Spectre"). Kind of lame, kind of goofy, kind of boring, nothing about this show gelled. The sets were cheap and showed it, but the real sin is that the premise lacked a discernible through-line. "Elaan of Troyius" suffers from a lack of sci-fi cred and from an annoying guest star. If you're going to do an episode that hinges on a character being absolutely irresistible to men or women, they had damn well better be! This kind of reminds me of "Precious Cargo," the Enterprise episode that nearly made Padma Lakshmi intolerable. WTF, writers? Barbara Luna was cute, and you blew it. Kevin: I was not as pissed off by "Elaan of Troyious," but otherwise, you hit the inadequate nails on their respective inadequate heads. "The Empath" was a prime example of how a trick that serves an episode so well once, done incorrectly is distracting and knocks the episode down a notch. I want to single out "Savage Curtain." I always feel it's episodes like these that stick in the popular perception of Trek. It's got all the camp and cheesy special effects but none of the heart and intellect that make fans love it so fervently, and it's hard to explain that to people without sounding like a crazy basement-dweller. Believe me, I know from experience. Kevin: As you'll see from the graphs in a minute, we pretty much were in sync this season on what the good and great were; the only places we really disagreed were whether as episode was adequate versus sub-par or sub-par versus terrible. And yes, I tended to give everyone a little more leeway. I'm a pushover. I admit it. Now on to pretty graphs. 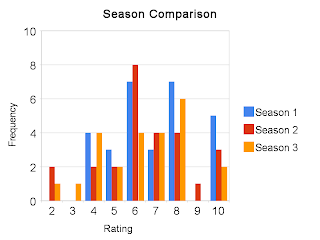 Kevin: As you can see in the individual and season rating distribution, the bulk of the episode were in the six to eight range. What sets this season apart, as the last chart shows, is the fall-off in 10 episodes and the bumper crop of 2s, 3s, and 4s. We talked a lot about this in the substantive commentaries, and the numbers really bear this out: when it came to close decisions, season 3 episodes tended to break for the lower of the two numbers. It felt like a lot of episodes were always one writing element or one production decision away from being in the next tier up. All that said, the season still averaged out about a six. We've said it before and we'll say it again. Bad Star Trek is better than average regular television. Matthew: Yes, what definitely sets Season 3 apart is the preponderance of episodes with a rating of two through four. The other seasons each have four episodes in this range, while Season Three has six episodes in this range. The lows were lower, even though the highs were similar. Matthew: As predicted previously, we see a generally linear decline in quality, both in our individual ratings and in the combined total rating. Your curve was a little softer on Season Three than mine, but it was still a marked decline. Nonetheless, it still ends up on the happy side of average, and by a pretty fair margin. 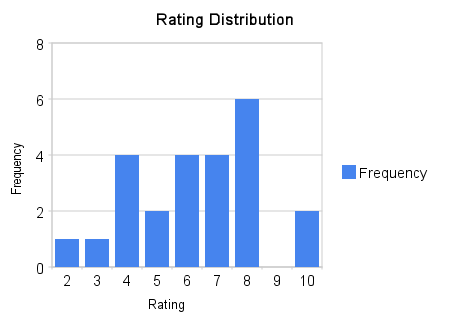 I will say that I don't expect any complete show to end up under a 3 average, but we'll see. There are certainly some seasons that do. But TOS Season 3 is not among them. It's still an above-average season of television, despite the bad rap it gets. You and I have just proven it scientifically. Kevin: I'm gonna say it. I can't wait to get cracking on TNG. Seven seasons mean two and one-third times the graphing possibilities. Plus there's inter-series comparisons to be made! I'm a nerd. Statistics are fun to me. Just be thankful I resisted the urge to calculate the standard deviation for each season. 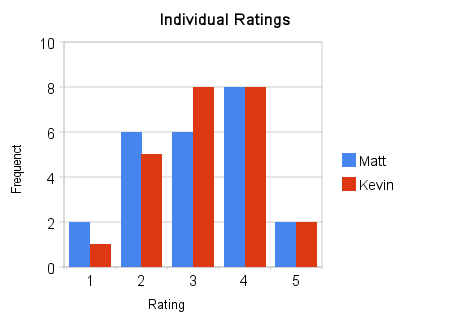 Kevin: I was surprised to find that I ended up with higher rankings than Matt on two seasons, because I would say that Matt likes The Original Series more than I do. It's not that I don't like it, and I've certainly gained a new appreciation for it, but Matt is more likely than I am to pick a random TOS episode to watch from the sum of all Star Trek DVDs than I am. In any event, the series still landed with an average above 6.5, no small feat. 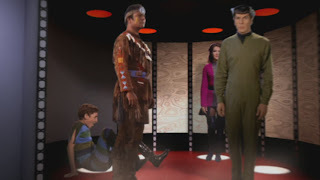 Season One has a decent shot of being the best single season of the franchise, and overall, despite its flaws and its somewhat over-exaggerated reputation for camp, TOS, taken as a whole, may be the cream of the Star Trek crop. Overall, I'm really glad I took this closer look at the show. I got a lot out of it, and I am particularly looking forward to the movies now, as I think I will have a deeper appreciation of them as well. Matthew: It's kind of amazing to imagine a world in which TOS is it. And for a good 4 years, people had to live with the notion that it would be. This was before VHS and DVD home video, before the movies, before even The Animated Series. I can only imagine being stuck with stupid, stupid, stupid 1970s television and hoping and praying that a local affiliate would carry Star Trek in syndication. Had Star Trek ended there, in this insane mirror universe scenario in which no one recognizes fanatical devotion and people have an aversion to money (hmm, kind of like the years 2003-2009), Star Trek would still be considered one of the better television shows of all time, and certainly the best pure science fiction TV series, at least in the US ("The Twilight Zone" and "The X-Files" are up there, but might be better categorized as horror/fantasy with minor sci-fi elements). Luckily for our universe, somebody realized what a bonehead move it was to axe the show, and realized there was money to be made with the property. It happened in fits and starts until the Great Trek Explosion of 1987-2003, but happily, it happened under the leadership of the likes of Gene Roddenberry, Robert Justman, D.C. Fontana, Harve Bennett, and later stewards such as Rick Berman, Jeri Taylor, Michael Piller, Ron Moore, Mike and Denise Okuda, Brannon Braga, and many more. Why do I mention these people? Because they love Star Trek. Each is very publicly on record stating that they love the series, the concept, the universe, and (though perhaps not an unalloyed love) the fandom. TOS was a product of this love. The love shines through on every frame of every episode. It is overwhelmingly obvious that this was a labor of love, executed under the direst of financial and network television circumstances. And if nothing else, that is what saves TOS from any criticism as "cheesy" or "lame", in my book. For the show to be as good as it is, even given these circumstances, is amazing and wonderful for us, the viewers. And that spirit typifies all of the other series and films, up until the fatal disaster, "Nemesis," and the unfortunate hand-off of the franchise to people who do not share the same love as those mentioned above, with "Star Trek (2009)." There is a thing called "Star Trek" now that is a crass, commercial vehicle, designed more to numb the senses and open the pocketbook than to fire the imagination and the stir the soul. But the other thing called "Star Trek," the thing we've been discussing for the past year, was intended to light fires and stir souls, from the very beginning, to the very end. And having watched TOS all the way through for this blog, it's easy to see why that spirit survived and led to the production of the later Trek we all enjoy so much. Kevin: I'm gonna jump back in to say that you hit the nail on the head when you summarize how the people in charge of Trek until recently really cared about what they were doing. I was recently watching some DVD special features and they had the standard go around of interviews with the production staff, and the interviews that stuck out for me were a set with D.C. Fontana and Judith and Garfield Reeves-Stevens. They all talked about the shows and their memories of working on their respective shows the way most people talk about their college dorm and all the silly fun they had. Something everyone who wrote a "Why I Like Star Trek" essay said was that they responded to sense of friendship and community on the show, and while that's certainly a credit to the actors, I don't think it's unfair to credit the production staff for that as well. Their passion for the show comes through as strongly as the actors'. Actually, I think that solves a rhetorical problem I've been pondering for a while. 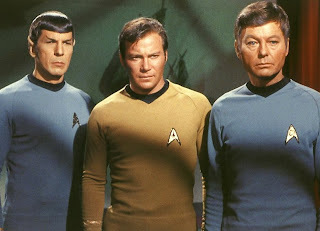 One of our creeds here at Treknobabble is that bad Trek is better than average television. Empirical observation confirms this thesis but doesn't quite explain why it should be so. I think the fact that everyone in the chain of production of the show cares so much about it imbues it with something irresistibly attractive. Even when it stumbles, it's not due to negligence or apathy or a condescending assumption of what the audience will accept. It's earnest, wide-eyed, enthusiastic failure, that even as it induces the odd groan, somehow never becomes repulsive. (Except, maybe, "Catspaw.") So even in failure, there's still an underlying charisma that is undeniable. Like Counselor Troi, I sense their care and affection for the show, and I can't help but share it.